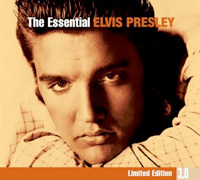 Sony Legacy will re-issue "The Essential Elvis Presley 3.0 Edition" 3CD set in an eco-friendly packaging on August 26, 2009. The set contains 48 tracks. why have they gone to this type of thing? and why is there 3rd cd with that small amount of songs? it dont really make sense to me and i wont buy it i already have the first one that came out. i dont like this whole cardboard box thing either i miss the regular hard cases it keeps the cd protected much more. i was dissapointed when i had to buy the 30 number one hits cd and thats the only way i could buy it same with from elvis in memphis and last year his comeback box set. they need to quit with this cardboard box nonsense how is it more eco friendly than the regualr old cases? i mean come on food for thought everyone how many trees do they need to cut down to do this? The 3rd cd of all the artists ( Michael Jackson, Billy Joel, Tony Bennet to name a few) of this Essential series all contain 8 or 9 songs only. I meant "CD 3" and "Oy Gevalt!" a yiddish expression common in New York -even though I'm not Jewish . :) The nice thing about this set from what people tell me is that they corrected some of the mistakes of the ELV1S 30#1 Hits smash collection of 2002, although I wonder if the mastering was all new or a hodge-podge. I 'm in no rush to find out just yet as the original of this set was a disappointment: yet another hits comp instead of something different , which a more daring label might have done. I give them credit, though, for reissuing the Legacy version of FEIM this year. I guess this is a case of what a friend I know calls "green-washing. "But in this age of downloading and "free" music, if they have to cut corners and also call it "green," so be it. They tend not to be a high-quality as real digpaks, which even some people here don't like. I don't mind this being out there (what a killer set) but ooh, that skimpy track 3! Enjoy seeing Elvis music in the CD racks while they still exist! I was in a remote rural area of the country and finally saw what one poster here always reminds me of: Walmarts in some areas have yet to get rid of their generous CD sections (I felt like I stepped back in time) but they have really cut back (except for the Mexican section - Oh Gevalt!) in many areas of the USA. So enjoy Elvis at retail in the US while you can! This particular set may not be the best or have the best packaging to those of us who have been Elvis fans for years. Packages like this are geared toward new buyers. We all have everything we need or want! And obviously there are newer & younger buyers out there as evidenced by the 12 awards Elvis just received during EW in Memphis. He received 12 awards for gold & platinum sales around the world for 8 CD's (albums), 3 DVD's & IPod sales. All of the countries involved are listed on the awards & the representative from Sony is one very happy man. They must be doing something right. Eco packing, no just cutting costs and feeding you the stuff over and over again. No real fan would buy this, I guess they are hoping to attract new buyers for that christmas gift to stuff into a stocking. Only 8 racks on CD-3? Is it made of chocolate or what? This is a card digipack anyway, opening up from the middle with 2 inner flaps. After the very poor packaging of "I Believe" with its damaged booklets & scuffed CDs, this cheap Eco nonsense is proving bad value for the consumer. Sure, the record companies save money using cheaper packaging, under the guise of being 'green', but we the buyers are getting poor value for money with this substandard packaging.